Welcome to another exciting installment of Spacemon, the tale of a Pokemon TRPG campaign! This is an alternate universe story with one key difference that shifts the entire narrative in an interesting way. You should get caught up on our canonical adventures here first! The faint orange light of Vandia’s Sunset Plains reflected off the Helix in the distance as the crew made their way back to their crashed vessel. Over the course of the few hours they had been gone, HERB, the repair bot Morgan had built several weeks prior, had completed repairs to the ship. Now that they had a lead on where Gilgamesh might have gone next, the crew was ready to depart from the planet. With an annoyed expression on her face, Shandra glanced back at the local girl who was still following them around. Shandra was thankful that the girl, who had introduced herself as Alex, had shown them where Gilgamesh had gone when he visited Vandia, but now she wished that she would leave them alone. Shandra assumed that Alex would leave once they got back to the ship, but it seemed the teenager had other ideas. “I want to go with you,” Alex spoke up as the crew began to board the Helix. Shandra let out a sigh as she turned back to face the girl. Before she got the chance to answer, Dmitri said exactly what she was thinking. “I don’t think we should take her with us,” the Romanov spoke up. “I don’t either,” Morgan agreed. Alex looked back at them with a dejected expression on her face, but said nothing. “Sorry, kid,” Shandra told her. “You’re not coming with us.” She then turned and followed her crewmates onto the ship. Joining everyone on the bridge, Shandra plopped herself down in the pilot’s seat. She fired up the engines and initiated the takeoff sequence. “You sure you got this?” Morgan asked Shandra, a hint of concern in her voice. Shandra gave her crewmate a reassuring glance and cracked a slight smirk. “Well, now that we’re not being shot at, I think I can handle a takeoff.” She then returned her focus to the front viewport as the Helix began to break through Vandia’s atmosphere. “Sounds good,” Shandra responded. She fired up the warp drive and launched the Helix into warp space. “It’s gonna be a few hours to the gate, at least,” she added, leaning back in her seat. “Let me know when we have something else interesting to do,” H spoke up. “Until then, I’ll be-” The cyborg suddenly cut himself off. “The Genesect!” he suddenly shouted, then he bolted out of the room. “I’m gonna go see what that was all about,” Shandra told her remaining crewmates. She jumped up out of her seat and hurried after H, leaving Dmitri and Morgan on the bridge. Descending the stairs, Shandra could hear the sound of H shouting. “What are you doing in there? !” she heard him shout as she drew near the cryo lab. Picking up her pace, Shandra rushed into the room to see Alex, the girl from Vandia, squished behind a cryotube that H was frantically trying to open. Shandra sighed, then walked over to the cryotube. She reached behind it, then grabbed Alex by the arm and pulled the girl out. All the while Alex frantically tried to kick her in order to break free, but the girl was unable to land a blow. “Let go of me!” Alex shouted, obviously panicked. “Oh,” H said, realizing his mistake. Suddenly, Alex grabbed two Pokeballs off her belt with her free hand, and out popped an Umbreon and a Lampent. In surprise, Shandra released her grip on Alex. The stowaway quickly yanked her arm away and moved behind her Pokemon. Alex started backing out of the room, keeping her Pokemon between herself and the cyborg as he advanced toward her. Shandra followed the pair at a distance. She had no idea how Alex had got on the ship, but she knew that she had to keep the situation from escalating. As H and Shandra closed in on Alex, the Sinai girl backed down the hallway, eventually ending up back in the cargo hold. Now with plenty of space, Shandra activated her powers and warped behind the stowaway. She then grabbed a Pokeball and released her Klefki. “What the hell?” Alex shouted in surprise. Shandra could tell that the girl was in distress. Alex quickly positioned herself between her Pokemon, putting her Lampent between herself and Shandra and leaving her Umbreon to face H, who had released his Helioptile. “Lumiera, Flame Burst!” Alex shouted, pointing at Shandra’s Pokemon. The Lampent launched a small jet of blue flame at the Klefki, taking him down in one hit. “Hah,” Alex said, a smirk appearing on her face. Just then Dmitri ran into the room and threw out a Pokeball. His Gyarados bursted out, the Pokemon’s long form wrapping around some nearby crates. “Go #6, use your Thundershock on the Lampent!” H commanded his Helioptile. The Pokemon noded and charged up some electricity, then blasted it at Alex’s ghostly Pokemon. “Ebony, use Faint Attack!” Alex commanded her Umbreon in response. The Pokemon charged into the Helioptile, bashing him into the side of a nearby crate. Meanwhile, H began charging up some electricity in his arm to power up his next attack. Suddenly, Alex ran up to the cyborg and whispered something into his ear. Whatever she said caused a deeply unsettled look to appear on H’s face. The cyborg grappled his feet to the ceiling and rapidly pulled himself up to escape. “Quick, now use Flame Burst, Lumiera!” Alex commanded her Lampent. The ghostly lamp Pokemon spit out another lick of flame, this time at the Helioptile. Just as the Pokemon stumbled back to his feet, the fiery attack collided with him and took him out of commission. A smug look crossed Alex’s face, but it was quickly wiped away when Shandra released her Clefable. “R.A.G.E., use Dazzling Gleam on that Umbreon!” Shandra commanded her Pokemon. A brilliant blast of light radiated out from the Clefable and collided with Alex’s Pokemon, doing a hefty number on it. “Ness, Waterfall,” Dmitri then ordered his Gyarados. The massive sea beast reared his head up in the air, then crashed his weight down on Alex’s Lampent, knocking the Pokemon out of the fight. “No!” Alex yelled, now sounding very distraught. “Ebony, Faint Attack that monster!” She shouted, pointing at the massive Gyarados in front of her. The Umbreon ran at the Gyarados and lept into the air, crashing into the side of its head, knocking the giant Pokemon to the ground. The Gyarados picked itself back up and let out a thunderously angry roar. It was clearly very pissed off. However, H was even more pissed off. Rage burned in his eyes as he sent a blast of electricity down from the ceiling, zapping Alex. The girl’s body spasmed as waves of electricity flowed through her body. She fell to her knees, looking rather shaken from the attack. Crap, I need to end this fast, Shandra thought. As much of an inconvenience it was that Alex had stowed away on the Helix, Shandra didn’t want the girl to come to any harm. It was clear to her that H could seriously injure Alex if the battle didn’t end soon. “R.A.G.E., use Sing!” she commanded her Clefable. The Pokemon hummed a soothing melody that put Alex’s Umbreon to sleep. Defeated, the girl recalled her Pokemon. “How did I lose?” she muttered. It seemed to work, as the cyborg dropped himself back down from the ceiling. Thinking the situation resolved, Shandra turned back to Alex. “Are you alright?” she asked as she pulled the girl to her feet. Alex looked at Shandra for a moment, but before she got the chance to say anything, Morgan stepped into the room. “How did she get in here! ?” the young woman shouted, clearly upset to see that Alex was on the ship. “H. Please don’t do that,” Morgan told H, trying to get him to calm down..
Shandra saw a look of horror appear on Alex’s face at the cyborg’s words. The girl began to back away as she pulled out another Pokeball. “H, it’s wrong to kill people no matter how much we may hate them,” Morgan said sternly. Fearing for Alex’s safety, Shandra teleported herself between H and Alex and stared the cyborg right in the eye. “No,” she told him. “Stop it, H,” Morgan told the cyborg coldly, sending out her Pikachu. “And she will soon be off,” H fired back. “You remember how well that worked with me, don’t you?” She asked in return. She recalled the way H had tried to launch her into space when they had first met several months ago, and found herself feeling even more sympathetic toward Alex. “Well yes, but you’re my rival and I refuse to have multiple rivals unless something else changes, but at the moment I only have one rival.” And with that, the cyborg grappled back up to the ceiling and charged up another blast of electricity. Seeing this, Alex turned and ran at full speed away from the cyborg, but it was not enough. Shandra winced at the sound of the excruciatingly pained scream of anguish that escaped Alex’s mouth as the lightning struck the girl in the back. “No!” Morgan yelled as Alex’s unconscious body collapsed on the ground. “Jean, Volt Tackle now!” Her Pikachu dashed across the floor, then lept into the air. The Pokemon slammed into H and unleashed his stored electricity, causing the cyborg’s numerous cybernetic augmentations to overload and shut down. With his magnetic feet shut down, H fell from the ceiling and landed right on his head, knocking him unconscious. While Morgan quickly rushed Alex off to the medbay, Shandra and Dmitri carried H’s unconscious body to his lab. Shandra kept an eye on the cyborg while her Romanov crewmate grabbed some cable and tied him to a support pole. It was not a moment too soon, because as soon as Dmitri had finished securing the cable in place, H began to come to. “Where did she go?” the cyborg asked angrily. “None of your business,” Shandra answered coldly. She was quite angry herself because of his actions. “You’re not going anywhere,” Shandra told the cyborg. With that, she turned and stormed out of the lab. Author’s Notes: So over halfway through writing this one I realized it didn’t really need to be here considering that it’s just a retelling of Volume 2, Chapter 3 from a different perspective, but I figured I might as well finish it since it was already almost done. I did include a few bits that are probably also canon to actual Spacemon, like the conversation the crew had on the bridge while Alex was sneaking around the Helix. I think overall the chapter will at least make the early parts of Blueshift flow better even if it isn’t strictly necessary to include it. From here things are going to really start deviating from the canon universe so stay tuned for that! That does it for this chapter. As always the Spacemon gang and I will be monitoring the comments to foster discussion and answer any questions. Feel free to give feedback and critiques of the writing so I can improve it for the future, or just leave a comment with what you think about what went down in this chapter or what you think might happen next! You can also revisit past chapters, check out the Spacemon Appendix which is a repository of information on all the lore and characters of Spacemon, or like our Facebook page to stay updated on all things Spacemon! 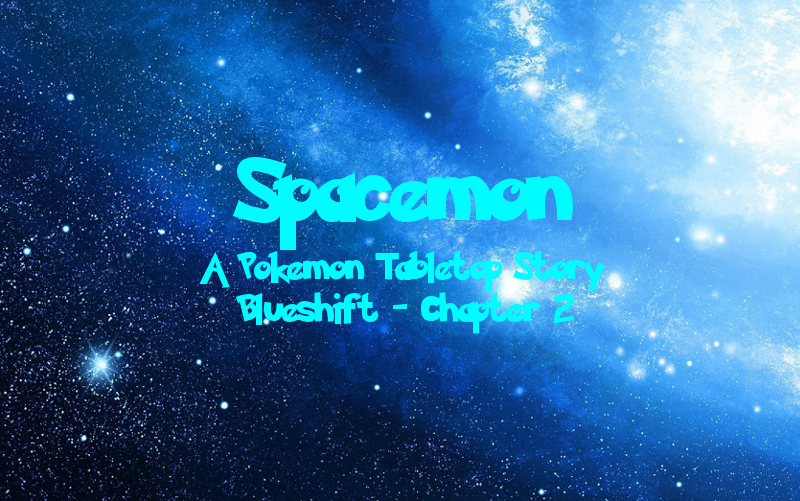 Click here for the next exciting installment of Spacemon: Blueshift!